"Early Dutch honeysuckle. 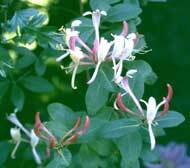 Large fragrant tubular purple/red fading to yellow/red flowers in May and June and again in late summer. Best in light shade, it tolerates most positions in the garden.